Although, I guess you can say this journey began September 27th, today felt like the day we begin the fight of our lives, the fight for Jake’s life. For me, anxiety and emotions were high. Today is the day our youngest, our Handsome, starts chemotherapy. I didn’t know what to expect, but my visions were overwhelming. We began by an early 7:15 appointment on the 20th floor (Heart floor) for and Echo Gram – probably one of the easiest tests J will ever have, yet he fought as though it were one of the worst (which didn’t quite start the day off well for him). We then headed downstairs to our ever so common 14th floor appointment to check in with our Oncology team, sign admittance papers, and access J’s port for the first time. As we stepped into the elevator the tightness in my chest was too much. We’ve taken that ride to the 14th floor, how many times now?? A lot! Something about today was so overwhelming. As I held my baby, and the floors ticked down, the tears began to well. I had to face the wall so others wouldn’t see tears rolling down my face, and as the doors opened, I couldn’t move. Sobbing, Henry led me out and I went to the window with the Twinkle Star Cow to gain my composure before walking toward THAT WALL… in BIG letters, it says, Hematology/Oncology. People say they hate to use the “C” word but I think I hate those two words worse – they mask the truth behind them… it is the Cancer Clinic…. it is the Cancer floor. Everywhere you look there are little ones with bracelets. I can’t help but look every time I see a child… does he have one? If not, then that child is there because his brother or sister has one. There are kids with hair, without hair, all with bracelets. As much as I know God loves the world, Jesus loves the little children, my heart drops and I often find myself asking, why the children? They are precious, and so little, and so sick. I held Jake tight as Henry checked us in and we found a sofa by the window. Jake wasn’t feeling well at all this morning and he wouldn’t let me put him down. It felt like a fever starting and he just wanted to be held – of course it didn’t help that he had just gone 9 rounds with me, Daddy, and a nurse over a simple Echogram. Those outbursts wear him out. We got into our exam room and Jake just didn’t look good. We spent some time with Dr. Zage and Dr. Foster and drilled them with all of our questions. Then it was time. Port access. He was already in my lap so that’s where he stayed so we could confine him as she went in for the chest. Nothing prepares you for seeing a needle go into your child’s chest with a line hanging out. It’s so medical and serious and horrible. But we lived through it while Jake screamed and his sobs slowly drifted to quiet murmurs that he hates that doctor (she was a nurse but he doesn’t differentiate yet). She hooked him up to an IV pole, began fluids, and took us to the infusion room. We found a quiet corner with a couple of big cozy chairs to wait until our room was ready. As we sat down to get comfy for a while, Jake and Daddy drifted off and I looked around to take it all in, eyes swelling, ready to burst at any moment. Some of the nurses would pass by with consoling looks, none of them saying a word, and for that I was thankful. As we waited, one of the Child Life Counselors came to visit with us and find out how they could help us. They are wonderful and care for the whole family, not just the patient. 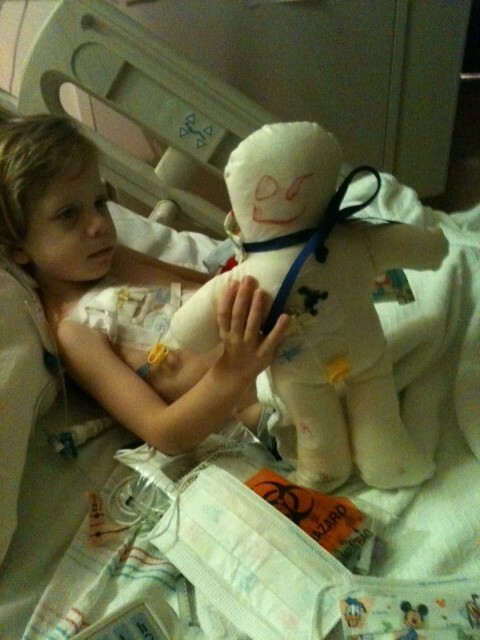 We discussed role play therapy with J over taking meds, his port, and hair loss. They also talked about bringing the rest of the kids in to talk and educate them about Jake’s disease and his treatments. She brought him a doll that has a port with all sorts of medical accessories for him to play with so he won’t be so afraid She also brought some glow-in-the-dark dino stickers and a Dinosaur Train color book with crayons… SCORE! The loveliest part was that she brought a form for me to sign from Peach’s Neet Feet (see www.peachsneatfeet.org ). Special friends contacted them on Jake’s behalf and they selected him to receive his own pair of special hand painted shoes in November. He is going to LOVE them and what a precious gift. 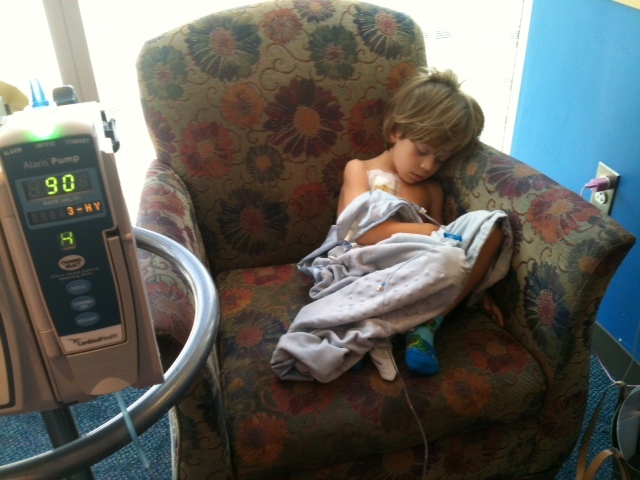 As we waited, along came the vitals cart (blood pressure, temp) and sure enough, Jake had a temperature. This really isn’t anything new to us. He runs a low grade temp off and on throughout the day, and over the past couple of weeks it’s become more consistent and common. This was, however, not something they were expecting. In they came to consult. However, when Dr. Foster came along and explained it as part of his cancer symptoms, they relaxed. It was becoming a long day full of waiting and at 3:00 they came for us. The 14th Floor Clinic isn’t far from the West Tower 9th Floor, just a tunnel and some elevators, but I don’t remember the ride – it’s a blur. The elevator doors opened, welcoming us to our new home away from home, or so I’m told. We got settled and around 5:30, they hooked him up. They started the chemo and it was painless and easy. Too easy. While we put our faith in Christ for putting all of the people and tools in place to bring Jake’s healing, today we also put our faith in the drugs that will offer Jake the armor to battle this horrible disease. It was a long day. An emotional day. And now we rest and prepare… breath in… breath out………. Thank you for your sweet prayers, Sheryl. Hi, I am a friend of Laura Birchler. I am so saddened by your story and what Jake and your family have been going through. Please know that I will be praying for Jake and your family to keep you all strong during this horrible trial you are going through. As you have done, Let Go and Let God, he will bring you through it. My daily prayers for healing and strength will be there for you. We love you Mardon, and I am here in anyway you need support. I wish I had a magic wand to take away the disease. I can’t help but think that Cancer is like some crazy serial killer out there. I wish we could hunt it down and keep it from doing any more harm. I feel angry that any child, much less thousands of children face this battle. I find myself hugging my children more and more each day, thanking God for all of his blessings. I feel guilty that I don’t deserve such a gift. Not understanding why some children get cancer, while others do not. So many questions, and so much emotion, and I’m not even walking in your shoes. I just hope and pray that God will heal him, and all of those children wearing a bracelet. Just know that we love you and are here for you to help in any way possible.